Preheat oven to 350°F. Slice and cube bread into croutons. Either let your bread cubes sit out (uncovered) over night to get stale, or heat on a sheet pan in 350°F oven to crisp for about 7-9 minutes. 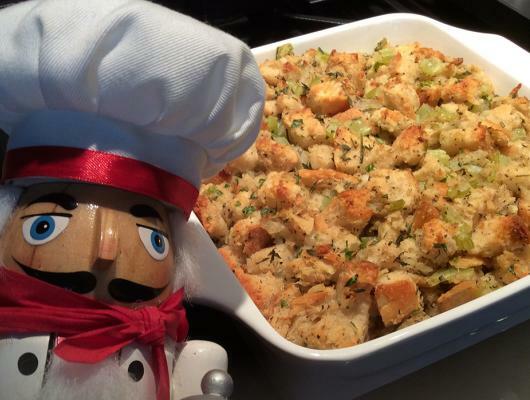 Croutons should not be crunchy all the way through, but if that happens, it’s still OK. Meanwhile, heat a skillet on medium hight and melt the butter in the pan, add the onions and celery and season with salt and pepper. Sauté until slightly tender (a couple of minutes). Transfer butter, crouton, onion and celery mixture to a bowl. Season with herbs, and at least half of chicken stock. Season, stir and taste. Mixture should be slightly wet, but not soaked all they way through. The less you stir, the better. Add more stock and seasoning if you need, but always taste before you put it into the oven. You should still see cubes of bread and not just mush (still gonna taste good, but won’t have the same texture or look as pretty). Bake uncovered at 350°F for 35 minutes in a preheated oven. It should just slightly turn brown on the top. This light and fluffy garlic and herb bread dressing (or stuffing) recipe is a “must have” for the holidays, but also great for any day of the year. It’s almost as easy to make as the kind in a box, but way better.